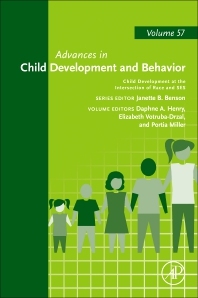 Child Development at the intersection of Race and SES, Volume 57 in the Advances in Child Development and Behavior series, presents theoretical and empirical scholarship illuminating how race/ethnicity and socioeconomic status intersect to shape children’s development and developmental contexts. Important chapters in this new release include the Implications of Intersecting Socioeconomic and Racial Identities for Academic Achievement and Well-being, The home environment of low-income Latino children: Challenges and opportunities, Profiles of race/ethnicity and socioeconomic status: Implications for ethnic/racial identity, discrimination and sleep, Youths' sociopolitical perceptions and mental health: Intersections between race, class, and gender, and much more. Rather than focusing on the additive effects of race/ethnicity and SES, which is typical (and a limitation) in the developmental literature, the scholarship in this book considers how the factors and processes shaping the development of children of color can differ markedly across the socioeconomic continuum. This collection illustrates how applying an intersectional lens to developmental science can yield unique insights into the challenges confronting, and assets buoying, both minority and majority children’s healthy development. Daphne A. Henry is a Postdoctoral Research Associate in the Learning Research and Development Center and the Department of Psychology in Education at the University of Pittsburgh. She received her Ph.D. in developmental psychology from the University of Pittsburgh. Her research investigates how the interplay between socioeconomic status and race/ethnicity influences children’s academic development. Dr. Henry’s work examines the origin and trajectory of achievement disparities between Black and White children from similar socioeconomic backgrounds as well as the factors that foment these racial skills gaps. Ultimately, her research aims to delineate how differences in early formative experiences promote disparities in school readiness and long-term educational outcomes. Her scholarship is multidisciplinary and incorporates theoretical insights and empirical evidence from developmental psychology, sociology, education, and economics to understand the underlying processes that produce racial and socioeconomic disparities in family life and child development. Dr. Henry’s research has been published in Child Development Perspectives and supported by the National Science Foundation, the National Academy of Education/Spencer Foundation, and the American Psychological Foundation. Portia Miller is a Research Associate in the Learning Research and Development Center at the University of Pittsburgh, where she also received her Ph.D. in developmental psychology. Dr. Miller has made substantive contributions to developmental science’s understanding of how income’s effects on children’s academic and behavioral functioning differ across learning and community contexts. In particular, her interdisciplinary scholarship has examined the intersection of poverty, place, and child development, how economic instability shapes behavioral development, and the role child care experiences play in children’s academic and behavioral development. Dr. Miller’s scholarship has been supported by the Spencer Foundation and been published in multiple flagship child development, sociology, and education journals, including Developmental Psychology, the Journal of Abnormal Child Psychology, the Journal of Educational Psychology, and Rural Sociology. Elizabeth Votruba-Drzal is a Professor in the Department of Psychology and a Research Scientist in the Learning Research and Development Center at the University of Pittsburgh. She is a developmental psychologist who completed an interdisciplinary Ph.D. in human development and social policy at Northwestern University. She is the director of the Family, Community, Schools, and Child Development Laboratory, where her research program investigates how key family, educational, and community contexts support child development from infancy through early adolescence. More precisely, her work explores how child care, home, neighborhood, and school factors influence early and middle childhood development, with a special focus on how early contexts shape the academic and behavioral development of ethnically-diverse and socioeconomically-disadvantaged children. Dr. Votruba-Drzal has conducted pioneering research investigating the influence of income and poverty on child development across the life course, the effects of early childhood education and care settings on children’s development, and the early development of children from immigrant families. She has received grants from the National Science Foundation, the National Institutes of Health, and the Spencer Foundation, and her work has been published in top journals in psychology, education, and sociology, including the Annual Review of Psychology, Child Development, the Journal of Marriage and Family, and the American Educational Research Journal.